All Byron Park District aquatic activities are held in the Byron High School Swimming Pool which is open to the entire community! The Byron High School pool is the perfect pool for lap swimming, water walking, open swim and group usage. The Byron High School Swimming Pool is a six lane 25 yard indoor pool equipped with a one meter diving board. Pool depth ranges from 4 ft. to 12 ft. Numerous activities including swim lessons, water aerobics and the Tiger Sharks Swim Team are offered year round. 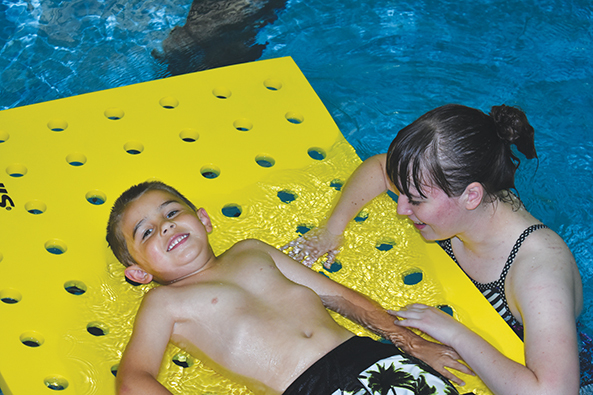 The Byron Park District's swim lesson curriculum combines expertise from the American Red Cross, Swim Lesson University, World Aquatic Babies & Children Network and USA Swimming Agencies. This curriculum has a greater focus on earlier progression of the front crawl stroke utilizing in-line body positioning (face in water) with a delayed focus on the backstroke. Plus, all instructors complete a comprehensive child-centered training program, in which they learn the progressions of each stroke and interactive teaching techniques! This summer we are offering participants the choice of a traditional swim lesson or the accelerated version. The traditional swim lesson is held one time weekly for eight-weeks. The accelerated program is held daily, Monday - Thursday for two weeks. Summer sessions begin in June. In this class, parents are taught to safely work with their child including how to support and hold their child. This class aims at increasing a child's comfort level in the water, building a foundation of basic swimming skills and breath control. Skills are taught through song and games. 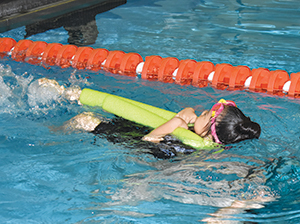 This class helps participants feel comfortable in the water while learning fundamental swimming skills. Skills covered include breath control, first-time submersion, front & back kicking with equipment, in-line kicking on front and front stroke with pop-up breathing. 3-4 students per instructor. This class is the same as Swim 101, but designed for students, 6-9 years of age, who have more developed motor skills. 3-5 students per instructor. The pre-requisite of this course is the ability to perform the skills in Swim 101/102. This class focuses on the formal strokes of front crawl (freestyle) with side breathing and introduces the backstroke. 3-5 students per instructor. This class is the same as Swim 201, but designed for students, 7-12 years who have more developed motor skills and can swim longer distances and duration. 3-6 students per instructor. Private lessons are a great way for your child to get individual attention. Our instructors will create a lesson plan to meet each participant's individual goals. Fee is $22/$27.50 for a 30 minute lesson or $27.50/$33 for a 45 minute lesson. Additional siblings enrolled in the same private lesson will receive half off the regular price. Contact Renita Krusey, Recreation Program Manager, at 815-234-6492 or email rkrusey@byronparks.org to discuss scheduling options.